Chick Shorten was born in Scranton, died in Scranton, and began his professional baseball career there as well. Charles Henry Shorten was born on April 19, 1892, to James and Amelia "Emma" (Scart) Shorten, natives of Ireland who had some to the United States as young adults, James in 1877 and Emma, at age 16, in 1873. James Shorten ran a grocery store, which billed itself as offering "a complete line of staple and fancy groceries." It was a family business and later bore the name Shorten Brothers, with Charles joining his brothers Paul and Frederick in ownership. The firm employed several other Shortens as well. The family all lived nearby. The grocery was at 2239 Pittston Avenue. At the time of the 1940 census, Charles lived across the street at 2226 Pittston, while Paul lived as 2225 and Frederick at 2235. Shorten attended the Yeates Prep School in Lancaster, Pennsylvania and was an outfielder for the team there.1 He also played two seasons with the semipro Minooka Blues. His first year in professional baseball was 1911 with the Scranton Miners of the Class-B New York State League. He appeared in 22 games, batting an even .250. Shorten batted left and threw left, stood six feet tall and was listed at 175 pounds. For his sophomore year in 1912, Shorten began the season with Scranton, playing center field -on opening day, but he was "turned loose" and wound up with Worcester (New England League) by May.2 He played there three years, improving his batting average each year – from .285 (1912) to .335 (1913) to .345 in 1914. 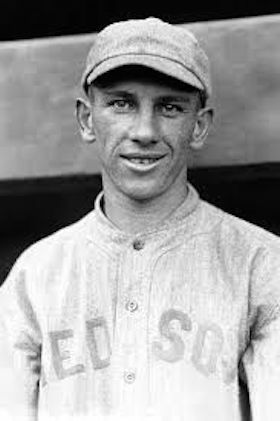 In the September 1913 draft, he was selected by the Chicago White Sox.3 They somehow let go of him, and on August 16, 1914, he was sold to the Boston Red Sox for $1,500.4 Worcester manager Jesse Burkett said he was the best player in the New England League. Shorten returned the compliment decades later, telling a reporter that Burkett "taught me how to hit…he was a great hitter, even at the age of 45. "5 Shorten was the league's leading batter at the time of the sale, and considered an excellent defender as well. He also had 21 steals, evidence of his speed on the base paths. He'd been pursued by several major-league teams, including the Buffalo entry in the Federal League, but the Red Sox won out. The Red Sox placed him with the Double-A Providence Grays (International League) and he hit well there, too, batting .322 in 137 games. His 175 hits led the league. In one remarkable game for the Providence Grays, against visiting Newark on June 14, Shorten recorded 12 putouts in center field; no other fielder had more than three. The Sox brought him to Boston at the end of the season, and he debuted with the Red Sox on September 22, making an out as a pinch hitter. His first two starts were on the same day, playing in both halves of the October 2 doubleheader in Washington and collecting his first big-league hits. He was 1-for-5 in each game, and he scored his only run of the year in the second game having reached first when he struck out and the ball got away from the catcher. He hit .214 in his 14 at-bats. He appeared in six games for the World Champions. Even looking back a century later, the Red Sox outfield in 1915 is still considered to be one of the best of all time – Tris Speaker in center field, flanked by Duffy Lewis in left and Harry Hooper in right. But the Red Sox traded Speaker to the Indians just before the 1916 season began. Shorten was already, beginning in 1916, seen as a "regular" albeit as the reserve outfielder for the team, which added outfielder Tillie Walker in early April. Shorten had the opportunity to start in left field for several games early in the season, Lewis moving to center. On opening day, playing behind Red Sox pitcher Babe Ruth, Shorten drove in his first major-league run, singling to left field to plate the first run of the game. The Red Sox won , 2-1. He drove in another run in the second game, also against Philadelphia, and he won the third game, on April 14, with a line-drive single to center field in the bottom of the eighth, for another 2-1 win. Walker played the lion's share of the games (128), but Shorten appeared in 53 games for the 1916 Sox, hitting for a .295 average. He had 11 runs batted in. He was error-free in the outfield, as he had been in 1915. The Red Sox won the American League pennant again, this time facing the Brooklyn Robins in the World Series. Manager Bill Carrigan's plan was to platoon Walker and Shorten in the Series, with the left-hander Shorten batting against right-handers, and Walker batting against lefties.7 Shorten played in two games. In Game Three, he singled three times (3-for-4 driving in one run in the 4-3 loss), and in Game Five, he singled again, driving in Hooper for another run in the team's 4-1 win that gave them back-to-back championships. He'd hit .571 in World Series play. Bill Carrigan retired but the Sox hoped to win again in 1917 under new manager Jack Barry. They finished second, nine games behind the White Sox. Shorten had the same role, but appeared in 69 games, often as a pinch hitter, batting just .179. He drove in 16, one of them winning the August 4 game against the Indians in the bottom of the 11th. In September, he finally committed an error – in fact, he was charged with two errors in the first game of the September 19 doubleheader. For his career as a whole, Shorten had a .985 fielding percentage, 10 errors in 652 chances. On August 9 he enlisted as a yeoman in the Naval Reserve. On October 18, with the war on in earnest, five members of the Red Sox were called to duty. Shorten and Jack Barry were assigned to duty at the Navy enrolling office in Boston. Ernie Shore and Mike McNally were assigned to the First Naval District paymaster's office, and Duffy Lewis was awaiting assignment.8 On November 15, he reported for duty at the Boston Navy Yard. By year's end, 11 members of the 1917 Red Sox were in military service. Desk duty at the Navy Yard didn't prevent him from taking part in athletics and Shorten played baseball for the local Navy team in 1918, on Jack Barry's team. Herb Pennock and Ernie Shore were on the team, as was Rabbit Maranville of the Braves. We couldn't find proof that he came to any of the games at Fenway Park, to see the Red Sox win the 1918 World Series over the Chicago Cubs. He had three good years with the Tigers, averaging 101 games per season. He hit .315 in 1919, the best average of his career, though with Ty Cobb and Harry Heilmann on the team, his was actually the fifth-highest average on a team that hit .283 overall. Detroit finished in fourth place. Shorten split his time between center field and right field – 133 games in right, 90 in center, and the occasional game in left, while also being used frequently as a pinch hitter. His first major-league home run wasn't until June 15, 1920, but the two-run shot in the third inning made a difference in the 3-2 win. The Tigers dropped to seventh place in 1920 and inched up one notch to sixth in 1921. They had three outfielders in 1921 – Cobb, Heilmann, and Veach, who had staggering batting averages -- .389, .394, and ..338. Each of them drove in over 100 runs. This was a team that seemed to think it didn't need Shorten, with his .272 and 23 RBIs. So they put him on waivers in December, and he was selected by the St. Louis Browns. There may have been some unknown arrangement between the Browns and the other teams; Shorten said that Cobb told him after the 1921 season that he was going to send him to the Browns. The 93-61 Browns came incredibly close to winning the pennant in 1922, falling just one game short, behind the 94-60 New York Yankees. Ken Williams, Baby Doll Jacobson, and Jack Tobin were the outfield, with .317 the lowest average among the three, every one of them playing in at least 145 games. Shorten was planned as the utility man, and he filled in and pinch-hit, appearing in 55 games and hitting .275. He hit two homers and drove in 16. Shorten didn't play in 1923. On February 28, he was waived to the Cincinnati Reds. On March 9, the Reds sent him to St. Paul as part of a deal to acquire Rube Benton. Shorten refused to sign his St. Paul contract or to join the team at Fort Smith, Arkansas, for their spring training. There was a controversy, however, in that St. Paul had been opposed to the draft, and Commissioner Kenesaw Mountain Landis invalidated the deal "on account of the ruling prohibiting major league teams from sending players to clubs opposed to the draft. "11 On April 16, Shorten was sold to the Nashville Volunteers. He refused to report there, too, and simply sat out the year. On June 6, he married Harriet Astle. In January 1924, Cincinnati sold his contract to Minneapolis.12 That city isn't far from St. Paul , so geography was probably no consideration. Perhaps wanting to get back in the game made the difference. He did report and played seven games for the Millers, though he was late to start due to a poisoned hand. He himself later recalled his arm as "going bad. "13 On May 29, he was brought to Cincinnati to play for the Reds. He appeared in 41 games, batting .275. In 1925 Shorten played for the Reading (Pennsylvania) Keystones. Manager Spencer Abbott resigned on May 30 to take an executive position with the Brooklyn Dodgers, and Shorten was named manager. It was his only managerial gig. Shorten played with Newark in 1926, and for his hometown Scranton team in 1927 and 1928. After he left the game, Shorten worked at the family grocery business, joined by a number of other family members, including – in time – his son Charles Jr. In addition to the sources noted in this biography, the author also accessed Shorten’s player file and player questionnaire from the National Baseball Hall of Fame, the Encyclopedia of Minor League Baseball, Retrosheet.org, Baseball-Reference.com, Bill Lee's The Baseball Necrology, and the SABR Minor Leagues Database, accessed online at Baseball-Reference.com. 1 In his Hall of Fame player questionnaire, he termed it Yates College. But it was clear in the context that he went there after eighth grade. 2 Boston Globe, August 17, 1914: 7. 3 Washington Post, September 16, 1913: 8. 4 Boston Globe, August 17, 1914: 7. 5 Chic Feldman, "Dangers of Night Travel Dictate Shorten's Retirement," The Scrantonian, December 20, 1959: 53. 6 Hartford Courant, September 24, 1915: 10, and Cleveland Plain Dealer, December 2, 1915: 14. 7 Boston Globe, October 5, 1916: 7. 8 Hartford Courant, October 19, 1917: 14. 10 The full outline of the deals is offered in the Boston Globe, January 18, 1919: 1. 11 New York Times, April 3, 1923: 20. 12 Columbus (Georgia) Daily Enquirer, January 23, 1924: 4. 14 Los Angeles Times, December 25, 1926: 11. 15 The source was a set of handwritten lists that were donated to Morris Eckhouse by a former Indians birddog. Thanks to Rod Nelson of the Scouts Committee for this information. 17 Washington Post, October 25, 1965: C7.